It's official. We're old. We are now the proud owners of a mini-van. The Swagger Wagon. Karyn has spent the past couple of months searching for vans and she finally found one she liked. It's a 2003 Mazda MPV. We were looking at Honda but in the end, this one fit our needs. It's not too big, not too small, and it rides great. It has an outlet in the very back for Jay to be able to charge his iPod. Rear A/C control to keep Isaiah busy. Two captains seats in the middle for the twins. Perfect. We're as excited as people who own a mini-van can be. I never thought Karyn or I would be driving a van but here we are. We don't have a choice if we want to go places as a family. We are soon to be a family of six and cars/suv usually only seat 5 unless there's a 3rd row seat. Usually suvs with a 3rd row seat guzzle gas. 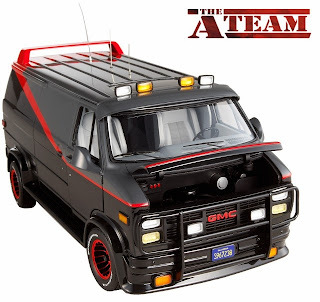 Now if Karyn will let me paint it like the A Team van, I'll be happy. Grammy and Grampy (Karyn's parents) are coming into town this week for her brother's ordination. We have several things planned for their visit. There's really never enough time to spend with them since they live so far away. We're excited to see them and I know Karyn can't wait for someone, other than me, to rub the magic belly. She's getting big and pictures don't do it justice. You have to see her in person. She's 21 weeks now and growing. None of her old clothes fit her anymore. She is beautiful and now there's even more of her for me to love! We're getting bunk beds for the boys. Scary thought. My brother and I always shared a room growing up and bunk beds were always our favorite. I preferred the bottom bunk and being older, I got it. My sons already have began arguing over who gets the top bunk. I think Jay will win since he's older and less likely to fall off climbing up. We still have to get the bedrooms "twin ready" and we're running out of time. Our schedules were already busy and now they're jam packed with "to do" items. It feels like we never stop moving. We'll rest when we retire, I suppose. I don't know about Karyn but I plan on golfing. A LOT when this 8-5 life ends. We go back to the doctor for the twins on October 7. That will be the beginning of the bi-weekly appointments. That means we're getting close. Between October 7th & the end of the year is the period where we have to monitor Karyn for signs of early labor. With twins, the risk is always there. I will be taking bets on how many times we go to the hospital for Braxton Hicks. I'm a bit overprotective and I'm sure I'll be in panic mode everytime she grunts. She grunts a lot. Like a sasquatch with a bellyache and it'll only get more frequent. She's doing great under the circumstances and I'm proud of her. When I said prayers with Isaiah last night at bed time, we prayed for the twins. We asked God to bless Audrey and Bailey. Isaiah said "Hehehe, Bailey." I asked him if he likes the name Bailey. He said "Yes!". I asked if he liked the name Audrey, he said "Meh." I guess you can't win them all. Both boys are very excited and anxious for their sisters to get here. I know they'll be great big brothers and look after the twins. I just hope they learn quickly that girls won't always laugh at their farts like brothers do. Poor girls. We'll keep praying for them.